Unfortunately, this product of his 30-year-old memory differs so substantively from what he said and wrote at the time that it would be destroyed in a court of law. 1. In Paragraph 6 of the affidavit Halt reiterates his claim first made over a decade after the incident that the Orford Ness lighthouse was as much as 40 degrees to the right of the unknown light. (At the time of the incident, no mention was made of the lighthouse at all, just an unidentified flashing light.) As maps and photographs of the site make clear, from Halt’s position at the edge of the forest the lighthouse is not 40 degrees to the right. Rather, as the skeptics have long pointed out, it is almost in line with a farmhouse across the field in front of him, the same direction in which he saw his unknown light. His claim that the lighthouse was as much as 40 degrees to the right of the UFO is unfounded. 3. According to Paragraph 8, one of the starlike objects supposedly moved overhead and sent down a laser-like beam to their feet. Halt has told this astounding tale in many interviews, but this astonishing occurrence is missing from the memo and tape. Instead, the memo and tape simply refer to the objects as being about 10 degrees off the horizon, nowhere near overhead. Although Halt describes the object to the south as apparently beaming down lights, there is no mention in the memo or tape of a beam of light coming anywhere near them. It seems that this part of the story is a more recent elaboration on Halt’s part. 4. In Paragraph 9 Halt says that this same object moved back towards Bentwaters and sent down beams of light into the Weapons Storage Area. But according to his memo and tape the object he is referring to remained in the south, over Woodbridge, not Bentwaters to the north. This part of the affidavit is in clear contradiction of the facts. 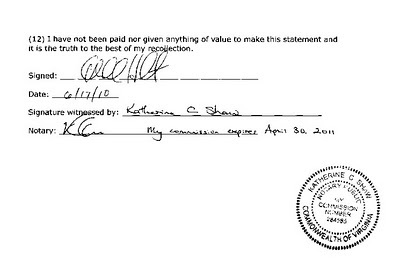 Halt should have checked what actually happened before committing himself to paper in a notarized document. 5. Also in Paragraph 9, Halt refers vaguely to “several airmen present” who supposedly told him that they saw the beams. However, he neglects to mention that airman Tim Egercic, who was on duty at the Bentwaters Weapons Storage Area at the time, has specifically denied that any such beams came down into the WSA. Elsewhere, Halt has claimed that his superior officer, Col Ted Conrad, also saw the lights. However, Conrad has said that he was watching from outside his quarters at Woodbridge but saw nothing that resembled Halt’s descriptions. This whole part of Halt’s story seems to be at odds with the facts. 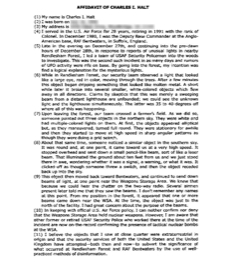 If the purpose of this affidavit was to add credibility to the events of the Rendlesham Forest Incident, its effect is almost certain to be the opposite. It should now be clear that Col Halt’s pronouncements on the case can no longer be taken seriously, although they continue to provide entertainment value for those who wish to believe in the incredible.